When a new article is created in Content Station 10 for use in the Print editor, the article is based on an article template in which the default article components are defined. Once the article is created, users can add or remove article components manually when needed. Adding an article component is done by choosing it from a list. Figure: Adding an article component in the Print editor of Content Station 10. 1 Requires Content Station 10.16 or higher. Configuration is done on Enterprise Server and can be made to work across all Brands and/or to work across specific Brands. The method of configuring article components has changed since Content Station 10.16 with the introduction of the Management console. The steps described here assumes that you are using Content Station 10.16 or higher. For information about the method for Content Station 10.15 or lower, see the bottom of this article. The Management console is made available through the Content Station 10 Server plug-in. It is assumed here that this plug-in is fully installed and working. Log in to Enterprise Server using an admin account, open the Integrations page and click the Content Station 10 icon. The Management console is shown. It currently only contains the option to manage article components. 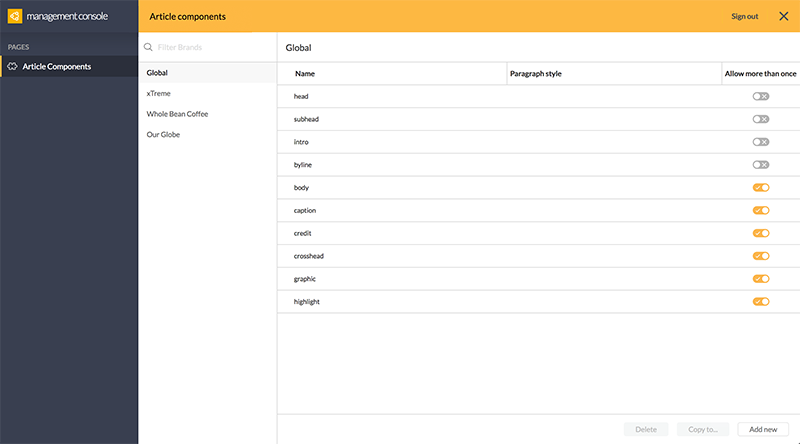 The Article components page contains a list of the Brands that are available in Enterprise and the article components that have been configured for each Brand (if any). Note: When loading the page for the first time, the information for the components section is loaded from the componentDefs.xml file. This data is subsequently stored in the Enterprise database. Any changes made on the page are therefore also stored in the database and will not be reflected in the componentDefs.xml file. For each Brand you can configure which article components appear in the list when a user clicks the option to add a component. Each Brand by default makes use of the components of the Global Brand unless specific components are assigned to it. Create a component manually by clicking 'Add a new component' or 'Add new' in a Brand. Copy components to another Brand by selecting one or more components in a Brand and clicking 'Copy to...' . Select a component and click Delete. Click on a name to edit it. Click a component, hold it, and move it to the new position. Each component will typically display text in a specific style. Example: The text in a header component will look different than the text in a sub-header or body component. Add the paragraph style to a component by clicking the Paragraph style field and typing the name of the style. Note: The spelling of the name should be identical to the name as it exists in the article (apart from the use of upper and lower cases: this is not checked). Tip: Include the group name when the style is placed in a style group: My Style Group/style name. Some components should only exist once in an article while other components typically occur multiple times. Example: An article typically has one header component and multiple body and graphic components. To control this, enable or disable the option 'Allow more than once'. When enabled, the component will remain available in the list for a user to add; when disabled the component will not appear in the list when it is already available in the article (for example after adding it). Configuring article components in Content Station 10.15 or lower is done in the componentDefs.xml file on Enterprise Server. default is not used in Content Station 10.
parastyle is not used in Content Station 10. Example: You might want to set this option to 'true' for graphic components while setting it to 'false' for the header component. 21 February 2017: Added information about configuring article components using the Management console.